The EC3600 is the mid-range model in our value for money EC generator line-up. The EC range is built as an economically specified machine and offers robust four-stroke reliability housed within the traditional generator frame. 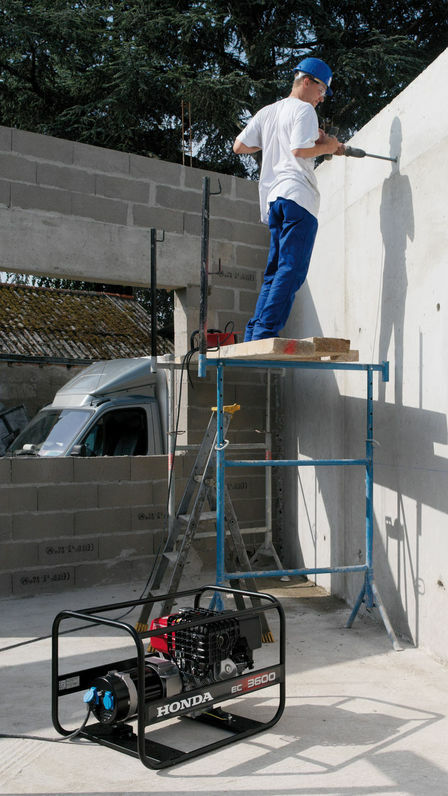 The EC range is used widely throughout the construction industry due to the rugged build quality and the continuous reliability customers have come to expect from Honda. The EC3600 offers the user dual voltage output, 115 / 230 volts, ideal for running 110 volt power tools and standard 240 volt appliances (To power the kettle at break time). Featuring a 6-litre fuel tank, running on unleaded petrol, this model will provide 3600 watts of power for 2.8 hours before requiring a re-fill. Honda four-stroke reliability housed within the traditional generator frame. Durable frame of high quality welded and powder coated tubular steel for extended durability, easy lifting and light weight. Circuit breaker outlets avoid equipment damage and injury in the event of a short circuit. Optional wheel kit available allowing a single user to move the generator around the site. Dual voltage output, 115 / 230 volts, ideal for running 110 volt power tools and standard 240 volt appliances. 5.3-litre fuel tank running on unleaded petrol providing 3600 watts of power for 2.9 hours before requiring a re-fill. 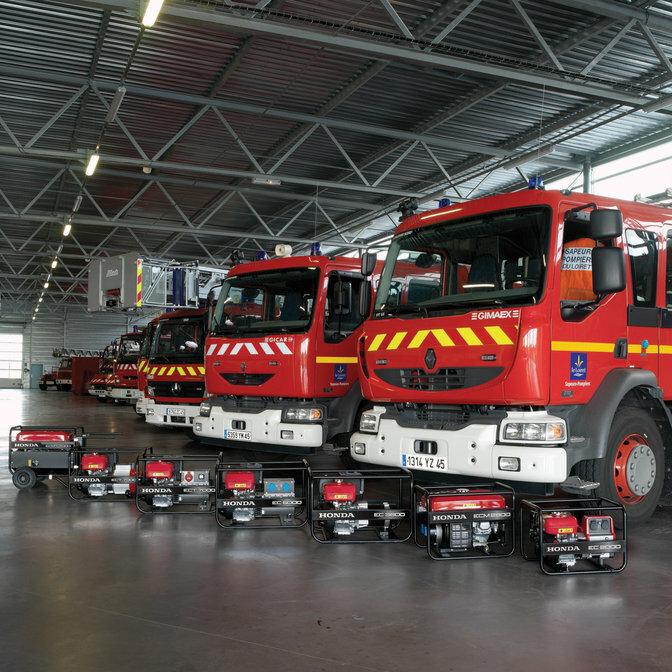 We rely on the Fire Brigade during an emergency, and many units in turn rely on Honda generators for their emergency power. In a life or death situation power is needed instantly - whether it be on the side of a motorway or inside a collapsed building - to operate vital equipment and save lives. Just fire it up and forget about it. Practical sockets and controls make starting and running these generators quick and simple. Just start it and let it get on with the job, because the unique Oil Alert™ will automatically switch the ignition off if the oil level drops below a safe level. It's as safe as can be.